Sometimes a great video pops into my Facebook feed and I take time out to watch it. This is one of them. Mike Rowe, most commonly known at the guy from Dirty Jobs, did an interview with Reason TV last year and discussed his views on college, specifically the high cost of it. At 40 minutes long, it’s worth a watch, especially if you have kids. One benefit of college–impressive books. Twenty years ago, my parents sat me down to discuss my future. While they said that college was on the table, they wanted me to consider another option, too. Although I had a pretty good GPA, I wasn’t in the top 10 of my class so I wouldn’t qualify for many scholarships. My parents made too much money (on paper, at least) so I wouldn’t qualify for need-based aid such as grants or even work study. To ease the financial burden, my parents suggested that I look into the military. Having both served, they knew what they were suggesting I get into. And with an older brother who had gone that route, they figured I had a good role model. As a moody teen, I ignored their suggestion and went directly to college after high school. 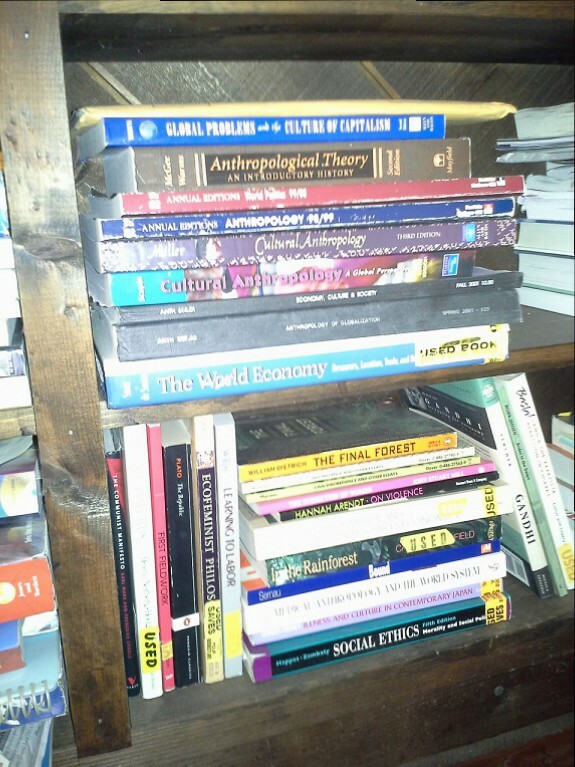 After three majors and four years, I got my BA in the ever-useful field of anthropology. A year later, after working two jobs in unrelated fields, I went to graduate school and earned a master’s degree. Then I found myself again working in an unrelated field because I couldn’t find a job in my field. It all worked out for the best though because now I have a job I love. While I don’t regret my decisions—after all, the research and writing I did while earning both degrees are skills that I use every day—I can’t help but feel a pang of jealousy that my brother was able to retire from the military at 38 years of age with four degrees paid for by the military (and U.S. taxpayers). In contrast, I finished grad school with nearly $50,000 in student loans. And I was lucky. When I locked into my interest rate, rates were at 2.9% and my monthly payment is still less than most people’s car payments. I feel bad for teens and young adults these days. They were told that if they just go to college they’ll have employers beating down their doors. A college degree is the new high school diploma, they were told. Tell that to the 15.2% of millennials who are out of work. You’ll make more money over your lifetime if you get a 4-year degree, they were told. That’s cold consolation when you’re living in your parents’ home and can’t pay your bills. There are jobs available; they’re just not the jobs that most people with college degrees want, which works out because they’re not qualified for the jobs anyway. In the last few decades, as more teens are being pushed into the college route, blue collar jobs have gone by the wayside. My high school had a great vocational technical education center that worked with the VocTechs at two other area high schools. Students could take classes offered at all three schools in fields like business, automotive, drafting, child care, etc. It was a great avenue for students who wanted to go the work route instead of the school route after graduation. I wonder how many students are encouraged to go that direction now. We need to eliminate the stigma of blue collar jobs. Blue collar jobs are good jobs. Sure, they can be back breaking and difficult. However, with research coming out that says that sitting all day in an office will kill you, they’re probably not much worse. For a teen just out of high school, the job provides a paycheck that affords them the ability to move out on their own and pay their bills. There should be less emphasis on going to college right after high school. Most teens have no idea what they want to do for the rest of their lives at 18. In fact, if we’re honest with ourselves, we didn’t either at that age. How many adults do you know who are on their third or fourth careers? Spending tens of thousands of dollars (or going tens of thousands of dollars into debt) to get an education to prepare you for a career that you’re not even sure you want is a foolish use of money. Some will argue that it’s more difficult to replicate the college experience as you get older; however, shouldn’t college be less about wild parties and more about preparing for your future? Now I’m not saying that no one should go to college after high school. There are students (like myself) who said, “College? Yes, please!” However the students who are sort of ‘meh’ about college shouldn’t be pushed by their parents, peers or whoever else to go. We shouldn’t tell teens that college is their only option if they want a good job. It’s not. Should they decide to go to college later on to pursue a degree, chances are they’ll be more focused on what they want and may even get more out of it than they would have as an 18 year old. But if they don’t go to college, then let that be their choice. Parents need to step back. As a parent, you always want what’s best for your kids. If you could create a bubble to keep them safe from hurt, failure, rejection and all of the bad things, you would. However, that’s not realistic and you’re doing your kids a disservice. My father works at a community college and every year at this time students come to his office to register for classes. In recent years, there are fewer students coming in alone to register. Instead their parents—usually the mothers–are in tow to fill out the paperwork for them, choose their classes and probably check to make sure that they wiped their asses correctly. Who’s getting the education here? There comes a time when you have to allow your kids to figure things out on their own. If your child can’t figure out how to register for classes, then bless the heart of the sucker who hires them later on. We need to understand the true value of college. Education is important!! More specifically, learning is important and it’s a lifelong process. A degree should be more than an expensive piece of paper. College costs have risen astronomically in the past two decades. Yes, a college education is valuable, but not when it puts you into a deep hole of debt. Encourage more involvement in the trades. There is nothing wrong with learning a trade. In fact, knowing a trade is a handy skill to have if you ever plan to own a car or a home. Now, there are smug folks out there who will say, “Whatever, I went to college so that I can pay someone to do it for me.” Well, hopefully college taught you which lube to buy because you’re less likely to get screwed if you know how to do things yourself. The other day an indicator light came on in my car that said that the tire pressure was low in my front tire. I for sure thought I had a nail in it. When my husband, a mechanic, took the wheel off to look at it, he couldn’t find a nail or a leak. I hadn’t checked my tire pressure in a while and the air was low. Now, had I gone to the dealership, it may have been a different story and I may have left about $200 lighter. In the end, my responsibility as a parent is to foster a love of learning, encourage critical thinking and independence and give my son the tools he needs to make good decisions. It’s not to push him in the direction I wish I had taken, inflict my goals onto him or the like. When he came out and they snipped that umbilical cord, he became his own independent little person, which he reinforces every day when he refuses to take a nap. My purpose is to explain to him the choices available, support his decision and help him brainstorm ideas to fund it. Now, we’ll see how that plan holds up in about 16 years.